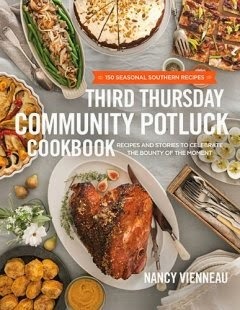 This cookbook is a collection of recipes and stories taken from a community potluck in Nashville, TN that happens every third Thursday of the month. The author, Nancy Vienneau, is a chef and promoter of local food. Nancy and her friend Gigi started this potluck as a way to gather a broad range of community members together to share their favorite seasonal dishes. They love to talk about food that is fresh, healthy, seasonal, and locally grown. This is not your average "potluck" cookbook. You will not find recipes enclosed in these pages using canned soups or other highly processed offerings. The whole idea is to bring your best to the potluck. Something homemade and special. I really love the whole idea of this cookbook. I would love to eat more home cooked, seasonal food--and have friends and family over to enjoy it. The recipes truly sound delicious-- from the Cast-Iron Heirloom Tomato and Rice Bake to the Brown Butter Honey Cake, there is something for everyone. I love how the chapters are broken up into months, with each containing recipes corresponding to that months seasonal food offerings. I also love the stories told in the beginning of each month and throughout each recipe. The pictures are beautiful and make me want to make everything all at once! I just wish there was a picture for every recipe, though I know this is not economical and would make the book huge. This is probably not a good cookbook for a beginner, but does have pictures and information explaining some of the cooking lingo. Overall, I would definitely recommend this book to anyone interested in creating their own potluck or just wanting to make fresh, seasonal food.